Sepsis is a difficult diagnosis to make, even in the hospital, where a plethora of tests are available to assist the clinician. 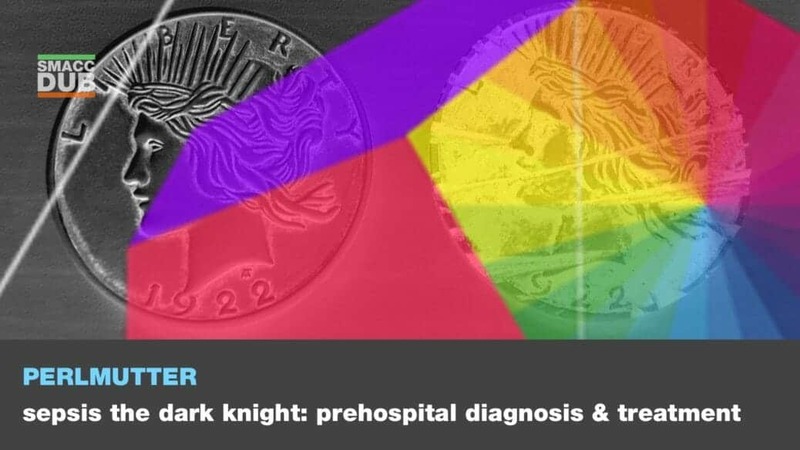 However, the diagnosis remains a challenging one, due to the very nature of sepsis: a shadowy shape-shifter notorious for its ability to hide in plain sight, eluding early diagnosis and treatment. For now, even in-hospital, there is no test with perfect sensitivity or specificity for sepsis. This is especially true in the prehospital environment, where we must rely on tools we can bring into the field: physical exam, point of care tests (lactate/venous gas), assessment of end-tidal CO2, and ultrasound. The aim of prehospital sepsis care is twofold: First, early diagnosis of cases ranging from early sepsis to septic shock. Point of care testing is essential. Lactate can assist in identifying occult sepsis and may also be used to prognosticate. Measurement of EtCO2 serves two purposes: first, in systems where point of care lactate is not available, there is evidence suggesting that EtCO2 is a reasonable surrogate for lactate. Secondly, for spontaneously breathing patients, EtCO2 provides an accurate respiratory rate, a vital sign that is notoriously poorly assessed. Respiratory rate plays a key role in both SIRS and SOFA/qSOFA criteria for sepsis, making an accurate count essential. Ultrasound should also play a pivotal role in prehospital sepsis management. Much has been made of the prehospital FAST exam; however, the ability of POCUS to gauge fluid responsiveness and cardiac function is far more useful. Assessment of the IVC may aid in determining the value of volume resuscitation by helping to identify patients who are responsive to volume and those who would be better served by early initiation of vasopressors. Similarly, assessment of cardiac function may prove extremely useful in selecting a pressor. POCUS may also assist in differentiating sepsis from other etiologies by identifying a source, such as pneumonia. The second fundamental aim is treatment equivalent to that available in-hospital, with judicious administration of balanced IV fluids guided by POCUS and clinical assessment of fluid responsiveness, early pressors (including push-dose pressors during RSI), and early antibiotics, particularly where transport times are significant. When sepsis is diagnosed by EMS, a “sepsis alert” should be communicated to the receiving hospital, in order to facilitate ongoing early, aggressive care upon arrival of the retrieval team. Advanced prehospital diagnosis and treatment can produce dramatic reductions in mortality from sepsis.